Don't let vehophobia keep you parked this summer. There are a lot of reasons why someone might not drive. They may have a medical condition that makes driving unsafe. They might live in an area where driving is inconvenient or unnecessary. Or they may have environmental concerns that mean they prefer to walk, take transit, or cycle to get around. A driving phobia, or vehophobia, is not entirely uncommon even if it seems like everyone you know is driving. It's particularly common after experiencing a car accident: one study found that 25-33 per cent of people involved in a crash that resulted in going to a hospital experienced a related fear of driving afterwards. For some people vehophobia may mean that you hate driving and try not to do it, but will if you must. Or it could mean that you feel fine driving under some circumstances but not others — for example, you may be OK with driving around town but not on the highway or feel comfortable driving in good weather but very anxious about driving in rain or snow. But if you avoid driving because of a fear of driving, it can feel very limiting. The good news is that whether that fear comes from an accident or traumatic experience, or has always been with you, there are ways to conquer it. Here are some tips on overcoming that fear, whether it's minor or more serious. Get proper instruction: "Fear of driving for new or occasional drivers, and certainly for those who have experienced an accident, can usually be attributed to unsure driving practices and unrefined instincts," says Joshua Meah, a marketer who works with driving schools. Learning good habits, and using an instructor's expertise to get rid of the bad ones, can reduce fear and lead to more confidence behind the wheel. Check with your province or territory's Ministry of Transportation to find the accredited driving schools near you. Try exposure therapy: "When someone has a fear of driving that is impacting their life and ability to get behind the wheel, it's crucial that they work to challenge this fear through exposure therapy and cognitive behavioural therapy," says psychotherapist Jennifer Rollin. Exposure therapy involves practising with what you fear in order to diminish that fear by retraining your brain in order to stop the fear response from happening in the first place. Lay out your fears: Make a hierarchy of your fears about driving, Rollin says, from the situations that provoke the least anxiety to the most. You can then work on conquering those fears in order from least to most; starting with your worst fear is likely to end poorly, but starting with the most approachable one on the list can give you a small win early in the process and create momentum. "Through gradually working their way up the hierarchy, ideally with the support of a therapist and driving instructor, they can overcome their fear of driving and reclaim their freedom," she says. Find ways to relax: Relaxation techniques like meditation or deep breathing may be helpful during the process, Rollin says. Take a minute before you start driving to do a few breathing exercises or to sit calmly, Headspace recommends, and focus on staying present and mindful of your actions as a driver while you're on the move. Put yourself in comfortable situations: Traffic School With A Smile recommends doing what you can to drive in the situations that are most comfortable. For example, you don't have to be in the fast lane on the highway, and it's OK to plan to take the longer route instead of the freeway. You can also take short trips and work your way up to longer drives. Slow progress is still progress. Use coping statements: You may feel a bit silly, but repeating a phrase of encouragement or a reminder of the work you're doing can help. "When they are challenging themselves it may be helpful to tell themselves some coping statements, such as, 'I am so brave for facing my fear;'" Rollin says. Know what anxiety feels like: Be familiar with the signs of anxiety that you experience, Traffic School With A Smile suggests, so that you can pull off the road in a safe spot in order to give yourself a chance to calm down when you don't have to worry about driving at the same time. If you have experienced panic attacks while driving, or worry that you might, learn the symptoms that one is imminent so you can get off the road before it's fully underway and avoid putting yourself and others in danger. Consider hypnosis therapy: Some people turn to hypnosis to overcome a fear, and a fear of driving is no exception. "Fear of driving has its causes in the subconscious mind," says Henrique de Azevedo, a clinical hypnotherapist. "We first have a primary cause, that can be directly related to the event or not, then a second, and even a third. Only with hypnosis you can deal with three causes effectively when needed." If this is something you want to pursue, look for recommendations for a trusted clinical hypnotherapist. 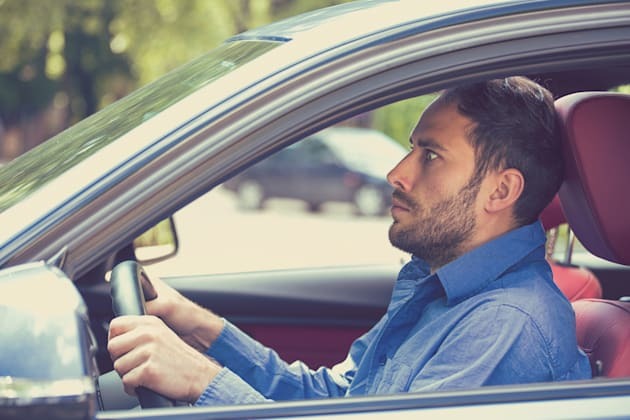 See a medical professional: If you are still struggling with anxiety about driving, or if your anxiety is more than just about driving, you may have generalized anxiety disorder. Talk to a medical professional about what this means, and treatments — like medication and cognitive behaviour therapy — that could help.